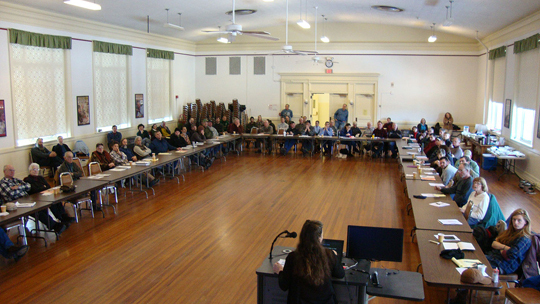 NYCO meetings draw farmers from around New York State. Experienced and novice farmers already farming organically, farmers transitioning to organic production, and those curious about what organic is all about are invited to the March 12 New York Certified Organic meeting on Tuesday, March 12, at Cornell AgriTech's Jordan Hall, 630 West North Street in Geneva, N.Y. The meeting is free, starts at 10 am, includes a farmer panel, speaker, potluck lunch (bring a dish to pass), and roundtable discussion after lunch that offers the opportunity to ask questions and hear from the combined experience of the group. The farmer panel will share their experiences on the use of high-speed discs and other tools for reduced tillage. The panel includes Eric Sheffer, who uses equipment that allows him to prepare a seedbed and plant pasture seedings in one pass; Rodney Graham and Thor Oeschner, who use German-made tillage equipment in their cropping systems; and Peter Marten, who uses a number of tools for reducing tillage on his farm. Cornell Professor Emeritus Dr. Charles Mohler, a weed ecologist, will discuss soil nutrient management for weed control and answer questions about how to manage difficult weed problems. New York Certified Organic (NYCO) is celebrating 26 years as an organic field crop and dairy discussion group. For more information, contact Fay Benson, 607-391-2669, afb3@cornell.edu. Benson is an educator with the Cornell University South Central NY Regional Team, project manager for the NY Organic Dairy Program, and coordinator of the NY Soil Health Trailer. 0 Comments to "Wayne County Farmers: NY Certified Organic Meets March 12"